Archival image of a mosque near Nefta, Djerid, appearing in the liner notes of Tunisia, Vol. 2: Religious Songs and Cantillations from Tunisia (1996). Archival Koranic image used in the liner notes of Islamic Liturgy: Koran - Call to Prayer, Odes, Litany (1960). From the public to the intimate the Islamic call to prayer, adhan,1 literally meaning “announcement,” pervades Muslim culture. It can be heard up to five times a day in Muslim communities, once for each of the five daily prayers. Often broadcast from the minarets of mosques and through media, there is also a tradition of reciting adhan into the ear of a newborn. In Muslim folk medicine, the adhan is even said to have medicinal qualities. There are a number of stories in the Islamic oral tradition about the origins of adhan. After establishing the first Muslim community in Medina in 622CE, early Muslims debated how to gather for prayer. One suggested that they use a bell. Another, a horn. Others thought of beating a drum or lighting a fire. But there was no agreement and the debate continued. Some say that one of the Prophet Muhammad's companions dreamt of gathering Muslims for prayer by calling with the human voice. When he told this dream to the Prophet, the Prophet is said to have responded that the Angel Gabriel had taught him the words for adhan, which Muslims have handed down since. The Islamic legal tradition, shariah, consists of five schools of thought (four Sunni and one Shiite), which determine details of ritual practice, including adhan. There are minor variations in the text among all five schools, mostly in terms of repetitions of the various phrases, although Sunnis typically include a phrase for the morning prayer, which is not part of Shiite praxis, and Shiites typically include a phrase about Ali, which is not part of Sunni praxis. With few exceptions, adhan is given in Arabic. With no fixed melody or meter, its sound is a function of certain linguistic features. Long vowels occur in the last words in most phrases of the adhan, and, according to taste, these can often be melismatically extended, while the timbre of adhan is influenced by the pronunciation of various letters in Arabic. In general the guidelines for calling adhan follow those for recitation of the Qur'an, although the formal rules for Qur'anic recitation are less binding on adhan. Ethnomusicologists have occasionally focused on adhan. Lois Faruqi identified two styles: laythi, an unembellished recitative style popular in rural areas, and sultani, a less recitative and more florid, urban style. Sultani seems linked to Ottoman sultans; Turkish Muslims are still noted for their florid and highly embellished adhan style. Among the Folkways recordings, an example of laythi style is ‘Muezzin's Call to Prayer’ from Tunisia and the sultani style is heard on ‘Ezan’ from Bosnia. Discussions of adhan often refer to Bilal ibn Rabah and Abdul Basit Abdus-Samad. An African slave in pre-Islamic Arabia, Bilal was freed by Muslims and became the Prophet's favorite muezzin (one who calls adhan, a.k.a muadhdhin). Abdul Basit was a famous Egyptian Qur'an reciter. Since Cairo was the recording and broadcast capital of the Arab world, media spread his style from Egypt to other parts of the Middle East and eventually throughout the Muslim world, where muezzins still imitate him. Styles of adhan can indicate cultural and political dynamics. Audio ecologist R. Murray Schafer links amplified adhan to the decline of Islamic civilization; sounds create community, he insists, and a healthy society sounds healthy. Ruth Stone, an ethnomusicologist, understands adhan as “corporate ritual” in Arabia, in that it delimits spheres of power between expatriate communities of oil company workers and the Saudi state. Amplifying adhan may assert an uneasy dominance, as anthropologist R. K. Dentan noticed in the use of adhan in regions of Malaysia with predominantly non-Malay populations. Based on my own fieldwork in 1991 and 1995, Syrian religious authorities often broadcast highly amplified Sunni forms of adhan adjacent to Shiite shrines, while Palestinians used amplified adhan as symbolic resistance to Israeli occupation, with the Israeli army occasionally confiscating the loudspeakers from mosques. Muslim communities and individuals have their own preferences when it comes to adhan. To get a sense of this diversity, I arranged focus groups during my dissertation research to speak with Muslims about their perceptions of adhan in various contexts. What emerged were multifarious preferences for religious practice that were heavily informed by personal anecdotes and cultural background. There was much debate about the amplification of adhan and whether or not something was lost through the mediation of technology. Participants described adhan in both musical and nonmusical terms, and discerned characteristics between various community styles. As a part of American Muslim community life, adhan brings a mixed reception. Some neighboring communities don't seem to mind the public adhan, as suggested by this 1990 Washington Post headline: “Muslim's Song Brings Little Discord: NW Mosque's Calls to Prayer Heard Through the Neighborhood." However, in 1979 in Dearborn, Michigan, neighboring communities asked the courts to ban amplified adhan on grounds that it violated noise ordinances. The Muslim community argued their case on grounds of religious freedom, and after a lengthy trial the judge ruled that the mosque could continue broadcasting adhan, but had to do so with a volume similar to church bells. In smaller cities where public adhan may be more recent, it might be called only during business hours, and not always with amplification. Originally from New York, J. Progler teaches humanities and social sciences at Ritsumeikan Asia Pacific University in Japan. An extended version of this essay is available at progler.blogspot.com. Faruqi, L. (1981). An annotated glossary of Arabic musical terms. Westport, Connecticut: Greenwood Press. Schafer, R. M. (1977). The tuning of the world. New York: Alfred A. Knopf. Stone, R. (1989). “Sound and rhythm in corporate ritual in Arabia." Revue Internationale de Theologie, Vol. 222, p. 75. 1 There are several common spellings of adhan, including azan, ezan, adzan, and athan. Video: Clip of the Muslim call to prayer, amplified from a Jerusalem mosque. 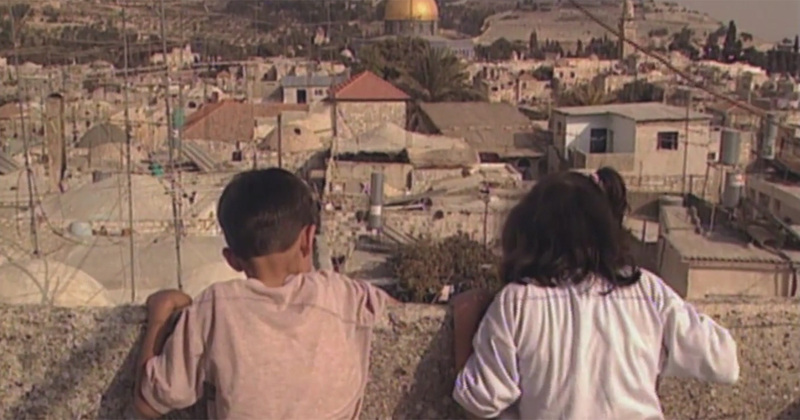 From Jerusalem: Gates to the City (1996).